Quality, customer service and innovation are critical to AFAB Precision Machining. In order to drive success in each of these areas, AFAB goes to great lengths to ensure customer success. The Lake Forest, Calif., company specializes in precision parts for the medical industry, where achieving accuracy and quality is crucial. 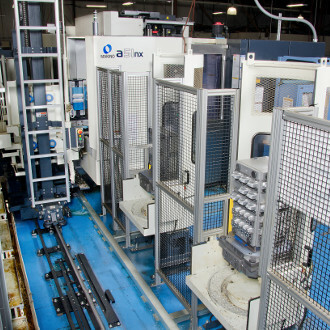 Already accustomed to the benefits of multi-axis horizontal machining centers (HMC), AFAB wanted to further invest in just-in-time production capabilities through automation so that they could handle any and all volume requirements that would come their way. The company also wanted to be in a better position to meet price pressures from customers. Makino handled all aspects of design and installation. AFAB personnel traveled to Makino’s Mason, Ohio, facility for training prior to installation of the flexible manufacturing system. Not long after the cell was in place, a Makino representative visited AFAB and provided a list of recommendations to further enhance performance. With the a51nx and MMC2 system, AFAB has been able to achieve 100 percent utilization rates, or 22-plus hours of production each day. The company has cut cycle times to almost half of what they used to be, and has regularly achieved tolerances to the required 0.0002 inch specifications, thanks to the construction and features of the a51nx. A medical lamp base that previously took 17 minutes for the first operation now is reduced to just eight minutes. AFAB estimates that eliminating repeat setups through the flexible manufacturing system is saving the company at least $100,000 per year. Managing tools and parts has become much easier. An operator can easily check the cell control system to manage tool life. Similarly, if a customer decides months later that it needs a part, AFAB is able to pull it back up on the system, and can run it without delay. The company attributes its improved competitiveness to their flexible manufacturing system investment, and they anticipate its performance to help drive growth in its customer base.